A 200g pot of our delicious Cornish Clotted Cream. Made to a traditional Cornish recipe using fresh Cornish milk from 25 herds with 25 miles of our dairy here in Cornwall’s beautiful Glynn Valley. 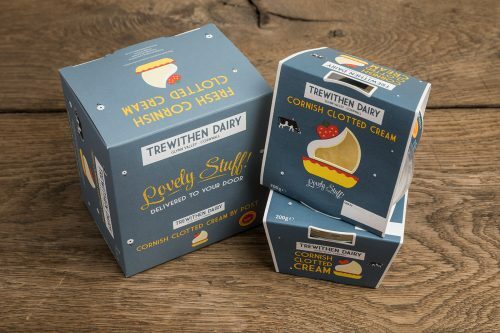 Cornish Clotted Cream has tails that trail! Stick your spoon in deep and watch the cream trail across your plate as you prepare your scones – it’s all part of the fun (along with sticky fingers! )… enjoy. 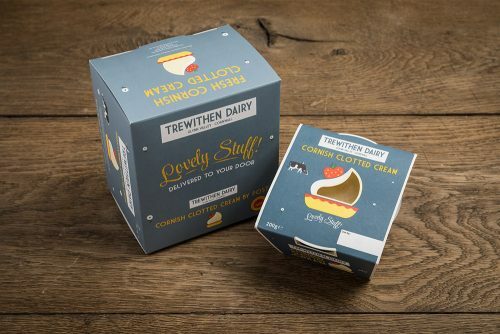 The Clotted Cream will have a minimum shelf-life of 7 days. It will arrive in an insulated box and should be refrigerated as soon as possible. Due to the perishable nature of the contents we are unable to deliver hampers to the following postcode areas: AB14 – AB56; BT1 – BT47; FK19 – FK21; GY; HS1 – HS9; IM; IV; JE; KA27 – KA28; KW6; KW15 – KW16; PA20 – PA78; PH15 – PH26, PH 32, PH42 – PH50; PO30 – PO39; TR21; ZE1 – ZE2.